"Damages Done: The Longitudinal Impacts of Natural Hazards on Wealth Inequality in the United States" will appear in an upcoming edition of Social Problems. A supplement to the paper highlights the wealth gap between whites and blacks attributable to natural disaster damage from 1999 through 2013 in 20 U.S. counties. Researchers Junia Howell, a scholar at Rice's Kinder Institute for Urban Research and an assistant professor of sociology at the University of Pittsburgh and Jim Elliott, a professor of sociology at Rice and fellow at Rice's Kinder Institute combined longitudinal data from nearly 3,500 families across the U.S. with governmental data on local natural disaster damages, FEMA aid and demographics. They followed these people from 1999 through 2013 as disaster damage of varying scale struck counties where they lived, and examined how their personal wealth was impacted. "Last year the United States suffered more than $260 billion in direct damages from natural disasters —mainly from hurricanes Harvey, Irma and Maria," said Howell, who was the study's lead author. "And there were also numerous wildfires, floods and tornadoes. 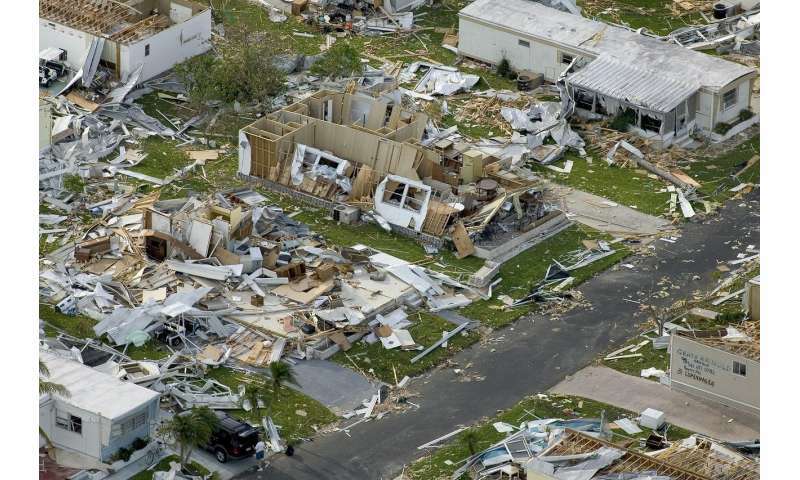 Data show that since 2000, approximately 99 percent of counties in the U.S. have experienced significant damage from some type of natural disaster, with costs expected to increase significantly over coming years. We wanted to investigate how these damages impact wealth inequality and accumulation." "In other words, whites living in counties with considerable damage from natural disasters accumulate more wealth than their white counterparts living in counties without major natural disaster damage," Howell said. "Put another way, whites accumulate more wealth after natural disasters while residents of color accumulate less," Elliott said. "What this means is wealth inequality is increasing in counties that are hit by more disasters." The story does not stop there, Howell and Elliott said. Counties that received more aid from the Federal Emergency Management Agency (FEMA) saw additional increases in wealth inequality beyond that attributed to the natural disasters themselves. For example, whites living in counties that received at least $900 million in FEMA aid from 1999 to 2013 accumulated $55,000 more wealth on average than otherwise similar whites living in counties that received only $1,000 in aid. Conversely, blacks living in counties that received at least $900 million in FEMA aid accumulated $82,000 less wealth on average than otherwise similar blacks living in counties that received only $1,000 in FEMA aid. Similarly, Latinos accumulated $65,000 less on average, and other races (majority Asians) accumulated $51,000 less. "It's unclear why more FEMA aid is exacerbating inequality," Howell said. "More research is clearly needed. However, based on previous work on disasters such as hurricanes Katrina and Harvey, we know FEMA aid is not equitably distributed across communities. This is particularly true when it comes to infrastructural redevelopment, which often has profound effects on residents' property appreciation and business vitality. When certain areas receive more redevelopment aid and those neighborhoods also are primarily white, racial inequality is going to be amplified." "Put another way, natural disasters were responsible for a $133,000 increase in inequality between homeowners and renters in the hardest hit counties," Elliott said. "In other words, in the counties with the most damage, natural disasters are responsible for a $159,000 increase in the educational wealth gap," Howell said. Howell and Elliott said the results indicate that two major social challenges of our age—wealth inequality and rising costs of natural disasters—are increasingly and dynamically connected. They hope the research will encourage further examination of wealth inequality in the U.S. and development of solutions to address the problem. "The good news is that if we develop more equitable approaches to disaster recovery, we can not only better tackle that problem but also help build a more just and resilient society," Howell and Elliott concluded. Did they account for insurance coverage differences between the races? Having comprehensive insurance would mean that those people would be the most likely to come out of a disaster financially ahead of those who did not, or whose insurance did not cover the type of damage.